amc | Wait! What's A Dial? With only two episodes left in this season, The Walking Dead has finally started to answer some questions that have been bugging viewers since the midseason finale. 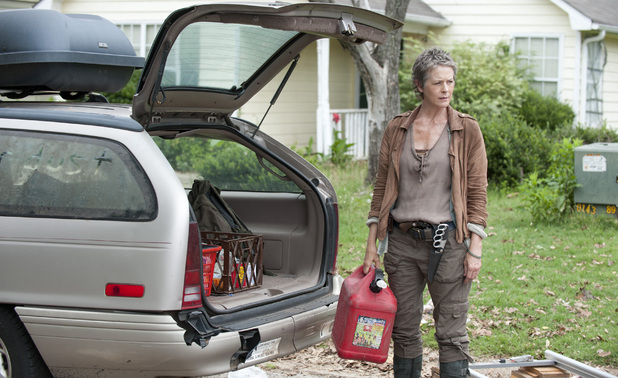 Last night’s episode focused on Tyreese, Carol, Lizzie, Mika, and Judith. On their way to Terminus, they find a home in the middle of nowhere. It seems to be the perfect place to start over; it’s secluded, has a water pump and a propane tank, puzzles, a doll, a big comfy dad chair. Basically everything is going to go back to normal, right? Of course not. One of the first questions that last night’s episode answered was why Carol was teaching the children how to fight. To put it simply, it’s because of Sophia. Carol described her as “not having a mean bone in her body”. She wasn’t capable of killing anything, which was her downfall. Now that Carol has two surrogate daughters, she doesn’t want the same thing to happen to them. Carol can see a lot of Sophia in Mika, in that she cannot bring herself to kill people invading the prison or even a deer except she has no problem killing walkers. Lizzie, on the other hand, cannot bring herself to kill a walker, but can kill people. And animals, Lizzie kills animals too for some reason; probably because, as Mika put it, she’s not right. Speaking of which, we also learned that Lizzie was the one feeding walkers outside of the prison. Which doesn’t come as a surprise to anyone since she has pretty much been friendly with walkers since she was introduced. So friendly, that she gets upset when anyone kills a walker. We see her have a near emotional breakdown after Mika shoots a walker right in front of them. Luckily, Mika calms her down by telling her to look at the flowers right next to her. Then she screams at Carol for putting down a walker that Lizzie was playing with. It’s hard to believe an eleven year old could hold that much crazy, but she does. Sunday’s episode of The Walking Dead continued to follow the formula of showing only a few characters at a time. This week we followed Rick, Carl, Michonne, Glenn, Tara, and the new group of survivors. Fans of the comics knew exactly who they were, but were the new survivors were introduced to the audience as Abraham, Rosita, and Eugene. They are traveling to Washington D.C. because Eugene is a “scientist” and he is going to “save the world.” I think it’s safe to put those in quotes because you cannot trust a man with a mullet. Especially one that claims to be a scientist. Michonne asks Rick what their plans are- whether they are going to stay in the house or continue to travel. Rick doesn’t have a clue, so he just makes her take Carl scavenging while he takes a nap. Rick is woken up by a group of strange men that have broken into the house. Since he is still weak from being beaten by The Governor, he hides under the bed. Things get awkward when a man walks into the room and decides to take a nap. Then things get really awkward when another guy comes in and demands to have the bed. Then things get super awkward when that guy chokes the other guy just to have the bed. He sees Rick hiding under the bed before he’s choked to sleep. Rick slips out under the bed while the both men are sleeping/passed out. Last night’s episode of The Walking Dead showed how it’s going back to its roots. The show, finally making its way to the comic’s second compendium, picked up where it had left off in the midseason finale. The prison is destroyed and the group is split up. Rick and Carl are together, Daryl is with Beth, Glenn and Maggie have each other and Tyreese is with the girls. Michonne, on the other hand, is alone again. Each episode looks as if it’s going to focus on a few of the groups at a time. This week focused on Rick, Carl and Michonne. Rick isn’t doing too well after being beaten up by The Governor. He has a hard time putting down a walker, and Carl ends up shooting it. Rick scolds him for using bullets because they no longer have a stockpile of ammo. He takes Carl into an abandoned home to recover. Carl just wants his father to take him seriously. 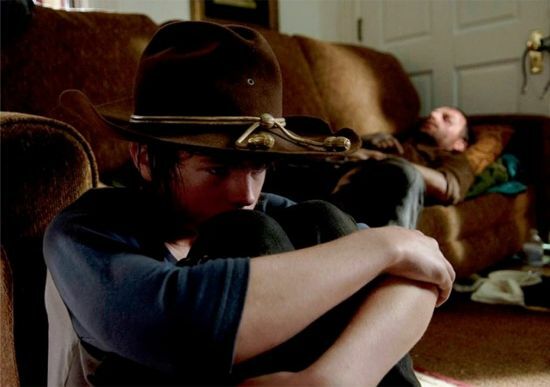 Rick then sleeps for most of the episode, forcing Carl to prove that he can live without Rick. So, of course, Carl gets into trouble because it’s in his nature. The Walking Dead is finally going back to the comics for its midseason finale. For the last two weeks, we’ve seen what The Governor has been doing since we last saw him, which has basically been to find a new group to lead. The episode starts out with The Governor lying about how Rick’s group is made up of horrible people. He quickly convinces the group to kill them in order to take over the prison. They don’t question him and blindly follow him to absolute destruction, which really shows that in the land of the blind, the one-eyed man is king. During the last two weeks, it seemed like The Governor had changed. He was caring for two women, Lilly and Tara along with Lilly’s daughter Meghan. The Governor was very paternal toward Meghan, not only because he’s “dating” Lilly but because Meghan is kind of like a replacement for his late daughter Penny. Meghan certainly saw The Governor as a father figure, even going as far as drawing an eye-patch on to a king piece from her chess set. It was her little way of showing how important piece of her life. It wasn’t until after her death that fans were certain that the Governor that we all know was back when he showed no remorse as he prevented her reanimation. Last night on The Walking Dead, things started to hit the fan. We not only got to see a rise of the problem inside the prison, but also outside. While Maggie helped clear out the people who had turned in the sick ward, Rick and Carl had to clear out the hundreds of walkers that took down the fences. 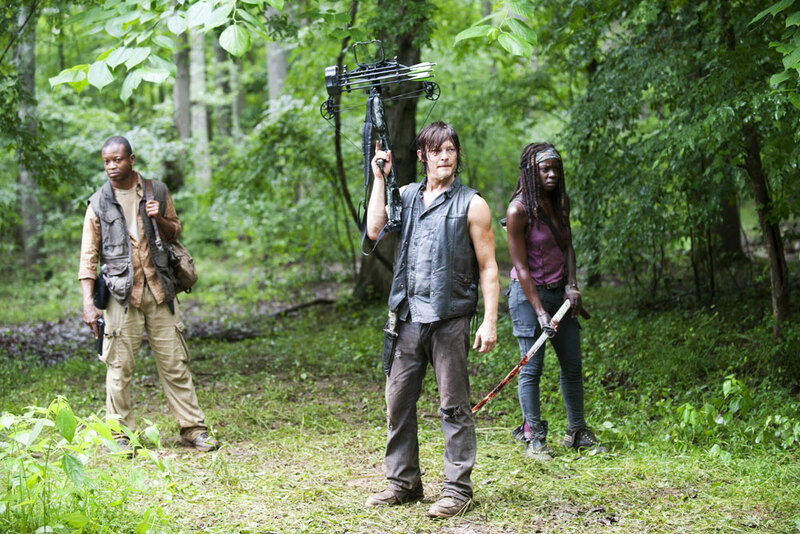 Luckily, at the eleventh hour, Michonne, Daryl, Tyreese, and Bob came back with medicine from the veterinarian school. Thank goodness, because Glenn wasn’t going to last much longer. Hopefully, this solves the “virus” problem. Although, they haven’t figured out how the virus is spread. 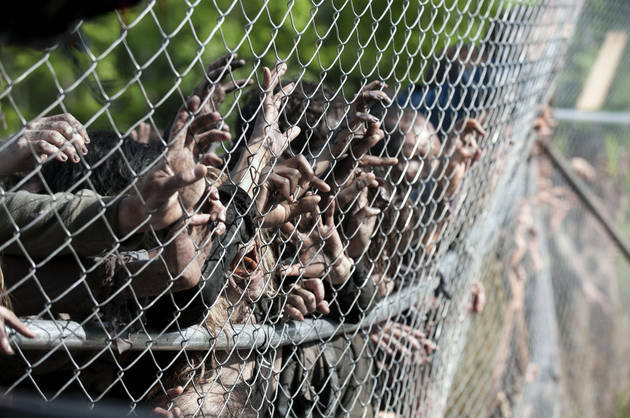 In last night’s episode of The Walking Dead, we finally got to get out of the prison. Since Daryl, Tyreese, Michonne, and Bob were taking too long to get medicine, Rick and Carol decided to make a trip of their own. This would have been a great opportunity for Rick to lecture Carol about killing two innocent people, but he didn’t bring it up. Instead he did something a little bit sneakier, he observed. While scavenging for medicine, Carol and Rick ran into some hippie couple that I don’t remember their names. It’s not important because they lasted 20 minutes anyway. Since Carol didn’t even bat an eyelash when they died, it was obvious that Carol has changed drastically. The old Carol would have expressed some remorse instead of convincing Rick to go back to the prison. Rick made an executive decision and exiled Carol from the group. Not only is he afraid of having her around his children, he’s afraid that Tyreese will kill Carol when he finds out she killed his girlfriend Karen. This is the best scenario since Rick is giving Carol a chance to start over again. Sunday night’s episode of The Walking Dead, started off with a punch. Literally. Fans gasped as our precious Daryl was attacked by the comic book favorite Tyreese. The most important part of this scene was how Rick reacted. He started punching Tyreese, it was similar to how Shane beat up Carol’s ex-husband: unrestricted and superfluous. Could this be Rick breaking free from his cop past? If there is one thing that The Walking Dead is good at, it’s drawing things out. In the second season, it took seven episodes to find Sophia. What I’m glad that they didn’t draw out is who burned two people who were infected. Rick did some detective work and approached Carol at the end of the episode. She came clean with little hesitation. Wait, the woman who was abused by her husband and lost her only child did this? In last night’s episode of The Walking Dead, the prison is starting to crumble as a safe haven. Outside forces, like the mysterious disease and the growing number of walkers near one spot of the fence, are threatening the whole group. Last week’s episode ended with a new character Patrick getting sick and turning into a walker. This set off a whole chain of events that unfolded last night. Rick theorizes that the illness and the sick animals could be connected. He also notices that the walkers are grouped near the livestock. He then sacrifices the pigs to draw the walkers away from the fence. Problem solved, right? There is also a new threat within the group. Someone is feeding the walkers live rats, which could be another reason why they crowded in one area. This same person might have been responsible for killing two people that were suspected to have the mystery flu. Since there are so many new people in the prison, this is a recipe for disaster. Last week, Rick learned to stop trusting people. This lesson is probably going to spread to everyone in the original group. This is evident because Rick and Carl are carrying guns again. Spoilers (show, video game, and comics) ahead, you’ve been warned. The Walking Dead kicked off its fourth season last night. After a sleeper third season finale, fans were hoping for an amazing premiere. The episode “30 Days Without An Accident” shuffled its way along. It spent the whole episode building up the rest of the season. Not that it’s entirely a bad thing, since that’s what premiere episodes are supposed to do. Most importantly, the group is quickly going to discover a whole new problem. This time, it isn’t a horde of walkers or a gang of crazy survivors. Not yet, at least. It seems that the animals are finally being infected. Whether it’s by the same infection or a whole new strain has yet to be determined. It started with one of the newer group members (aka walker food) thanking Daryl for the deer he hunted earlier. By the end of the episode, he mysteriously turns into a walker. Throughout the episode, Rick noticed that there were some sick animals in and around the prison. 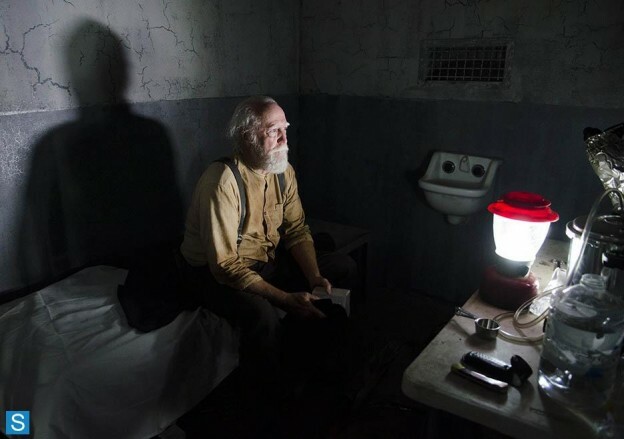 Hershel had stated that they have enough food to feed all of the people in the prison. Well, not anymore. So it’s only been a year, but it feels like many more. After the pilot, I knew there was no going back. This show has absolutely consumed me since then. I’ve been nervous for the finale ever since, not due to a lack of faith in Gilligan & Co., but because I wasn’t ready to say goodbye to these characters just yet. While “Felina” was utterly nerve-wracking, a fingernail-destroyer of an episode, it did leave us with some solace. When was the last time we thought that about anything on Breaking Bad? It was the perfect end to a perfect show that never dipped or even approached a downhill slope. The episode title guaranteed us three things: blood (iron, Fe), meth (lithium, Li), and tears (sodium, Na). A simple, straightforward formula that really could be the overarching theme of the show as a whole, but nothing else was needed. Walt’s death was inevitable, so Gilligan got in, got out, and got it done, but not before tying up every remaining loose end. He even gets continuations of almost every flashforward: leaving Denny’s, retrieving the ricin coupled with a particularly painful flashback to Hank prodding Walt to inject a little more excitement into his life from the pilot. Nothing was extravagant, save for a few masterful cinematography moments – the reveal of Walt behind the pillar in Skyler’s kitchen comes to mind.